In September 2014, I moved to take up a faculty position at Queen's University Belfast. Please visit my new homepage. My interest is in understanding the fine grain of how language is processed in the mind. 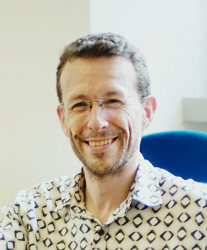 Several recent developments offer the promise of a comprehensive answer to these questions derived from the "bottom-up": the easy availability of enormous quantities of authentic text over the web, and the more nuanced models that can be derived from this; the application of machine learning and data-mining techniques to decode cognitive states from recordings of neural data; and the development of hybrid models that combine corpus-based, psychologically-founded, and neurally-grounded models of language. Undergraduate courses Introduction to Programming; Data Structures and Algorithms (taught through German); and Technical Translation (German) on programme in Computational Linguistics, Trinity College Dublin, 2003-2006. MEG Seed Fund: PI of project to fund exploratory audiobook experiments in computational neurosemantics using Magnetoencephalograpy. $10,000 over 1 year, awarded by University of Pittsburgh Medical Centre (Pennsylvania).